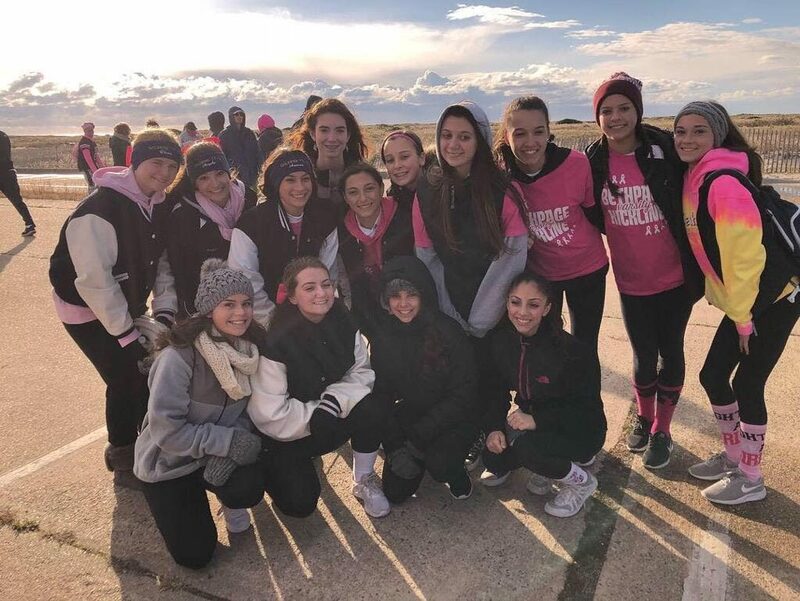 Members of the Bethpage High School varsity and junior varsity kickline teams participated in the Making Strides Against Breast Cancer Walk at Jones Beach on Oct. 21. In total, the kickline program was able to raise $825 for the American Cancer Society. The two teams joined hundreds of others in supporting those who have battled or are battling breast cancer as well as honoring the memories of those lost. The walk helps to raise awareness and funds to save lives from breast cancer. Each Making Strides event is a noncompetitive three to five-mile walk. The events raise money to fund innovative research, provide free information and support as well as to help people reduce their breast cancer risk or find it early when it’s most treatable. The district thanks the kickline program for its effort toward a great cause. Photo caption: Members of the Bethpage High School kickline program gathered at Jones Beach on Oct. 21 for the Making Strides Against Breast Cancer Walk that included raising $825 for the American Cancer Society.